Wolfgang Friedmann, Burns H. Weston, William T. Burke, and Ivan A. Vlasic explore the new frontiers and wealth and resources that are altering the patterns of the world economy.Since rapid and dramatic technological progress poses problems that can be solved only by international or multinational controls these legal specialists emphasize the urgent need for nonviolent measures capable of reconciling the interests of the wealthy and impoverished nations and of satisfying the rising demands of the underdeveloped world for participation in the scientific revolution. 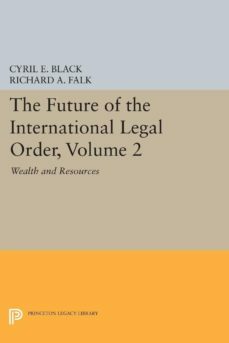 The existing situation and current trends are described, and detailed recommendations to strengthen the role of international law in the decades ahead are made.Originally published in 1970.The Princeton Legacy Library uses the latest print-on-demand technology to again make available previously out-of-print books from the distinguished backlist of Princeton University Press. These paperback editions preserve the original texts of these important books while presenting them in durable paperback editions. The goal of the Princeton Legacy Library is to vastly increase access to the rich scholarly heritage found in the thousands of books published by Princeton University Press since its founding in 1905.